Our range of products include cardiolabs cvent - 1200t ventilator and medisys - cardiovent transport ventilator. The Cardiovent Transport Ventilator has been designed for handling emergency situations of providing artificial ventilation. It may be used at casualty or during transportation of patients. It is very simple to operate. So even the paramedical stuffs can handle it for artificial emergency ventilation. 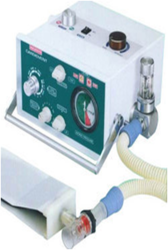 Looking for Ventilator Machine ?